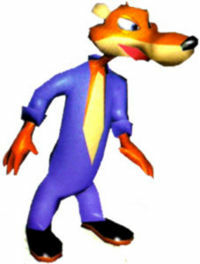 Snide is a weasel and the former chief technician of the Kremling Krew in Donkey Kong 64. He later assisted the Kongs at his headquarters, where they would recover the Blast-o-Matic's blueprints for him to stop King K. Rool from re-activating the machine. Snide is orange-furred with light fur around his cheeks, snout, jaw, and underbelly. Snide's eyes are blue, and he wears an open blue jumpsuit with rolled-up sleeves and polished black shoes. Prior to the events of Donkey Kong 64, Snide was responsible for being the Blast-o-Matic's lead designer. After completing the Blast-o-Matic, K. Rool became paranoid of Snide betraying him, so K. Rool fired him. After his expulsion, Snide moved to Donkey Kong Island and set up a headquarters named Snide's H.Q. When the active Kong first enters Snide's headquarters, he introduces himself and explains his backstory. He asks the Kongs to assist him by recovering blueprints, each being guarded by a Kasplat. Snide rewards them with a Golden Banana for each blueprint they recover. Later, right before the Kongs enter into Hideout Helm, a cutscene shows Snide telling the Kongs that he is delaying the Blast-o-Matic from firing; each blueprint allows Snide to delay the Blast-o-Matic by another minute. This cutscene even plays if the Kongs have never visited Snide's HQ. If the Kongs recover all forty blueprints, Snide allows them to replay most of the Bonus Barrel minigames at his headquarters. "The former chief technician of King K. Rool's is primarily responsible for the design and construction of the floating fortress and the Blast-o-matic. However, he has fallen from grace in the eyes of his boss and has been expelled from the team. Since then the inventive engineer has been living on the DK Islands and has been planning revenge on against King K. Rool." "He asks the Kongs to recover the individual parts of the torn-up carbon copy containing the blueprints for the Blast-o-matic. If they succeed in finding all the carbons, Snide's gains a wider scope of action for the Kong clan toward the end of the game. What's more, he rewards every carbon copy delivered with a golden banana." Snide is one of the characters featured in How to Draw Nintendo Heroes And Villains. Despite aiding the Kongs in his only game appearance to date, he is labeled as a villain. Snide's occupation and motivation for helping the Kongs was different in earlier versions of Donkey Kong 64. Rather than being chief technician, Snide was K. Rool's personal handyman and was frustrated that he was only given menial chores to do, eventually deciding to betray the Kremlings after K. Rool refused to let him work on his "Super Gun" project. This page was last edited on January 28, 2019, at 23:55.